FIRST YEAR COUNCIL STOPLIGHT PARTY! PARTY after reading week ERRRBODY? Got a deferred midterm to write because of that snow storm? need to relax and have a fun night? 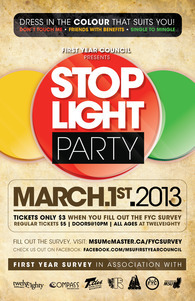 FIrst Year Council Presents The ALL AGES STOPLIGHT PARTY! McMaster’s largest annual multicultural event has returned! Pangaea is back to showcase over 20 cultures from a variety of nationalities, ethnicities and religions. On March 10th, ticketholders will have the chance to visit pavilions representing cultures from around the world and experience McMaster's largest cultural display. Following months of student consultation, lengthy discussions with University administrators and the recommendation of Undergraduate Council, the Senate of McMaster University has approved the adoption of a two day fall break beginning fall 2013. The Peer Support Line is a confidential phone service that members of the McMaster community can call if they need support or assistance with accessing helpful resources. It is staffed by 20 trained volunteers and is currently operating on Wednesdays and Thursdays from 7pm until 1am. The Peer Support Line can be reached at 905-525-9140 ext. 28888. The MSU's Ad Hoc Women's and Trans* Centre Committee will be hosting a live online chat Tuesday, February 12th at 8pm via MSU website. Elise Milani, Chair of the Ad Hoc Women's and Trans* Centre Committee will be joined by VP (Admin) and MSU President-elect David Campbell and Violetta Nikoskaya, to answer questions students may have regarding the committee's work. Meet People, Make Friends, Have Fun! What's not to love! Come join us and re-connect with your school and all your peers!